We finally pried ourselves loose from beautiful Bahía Tenacatita after nearly a week among the 15-20 cruising boats anchored in the sheltered north end. The bay is about 3 miles long, book-ended by some impressively jagged rocks at each headland. Near our anchorage was a tidal river connecting to a small lake, so we motored up it in the dinghy --"jungle cruise"! As we proceeded up it, the channel between the mangroves got narrower and narrower, until we were hand-paddling to avoid the branches just under the surface in a section only as wide as the boat. Memories of The African Queen surfaced. The local pangueros (boatmen) cut the mangroves back so they can keep up the tourist trade--if they didn't, the mangroves would completely close off the channel. We saw many birds, but no cocodrilos or iguanas. Yesterday we experienced a new kind of cruiser get-together. Led by the "mayor" of Tenacatita (a long-term cruiser who claims he was actually elected a few seasons back) we all dinghied to a quiet spot, tied to one anchored dinghy and shared food and stories. Mark from Southern Cross got up and sang, a capella, his own variation on Paul Simon's "There must be 50 ways to leave your lover," which he had creatively turned into "There must be 50 waypoints to enter Barra." I will explain why this is so clever in a bit. While in Tenacatita we swam off the boat nearly every day , also managing to scrape off the 5" of weed from the waterline. 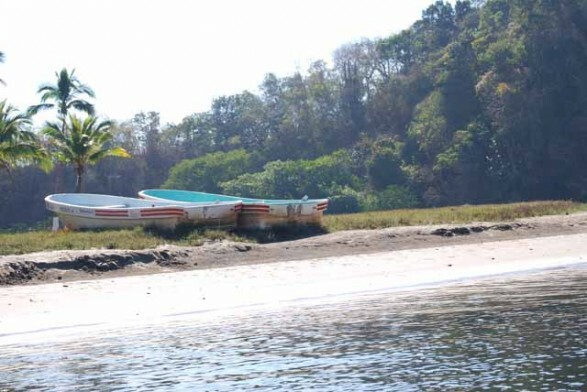 Other activities included practicing dinghy landings in the small surf at the beach (we were 2 for 4 on dry departures) and visiting the small village of La Manzanilla at the other end of the bay. A charming, if tourist filled, village, we were able to buy fresh fruit and vegetables there and have a nice dinner on the beach. The only negative memory was losing our small camera there on the last visit. It must be a sign of aging--we seem to lose things now more often than we break them. Almost every day in Tenacatita we were graced by two large pacific bottlenose dolphins cruising through the anchorage, often within a few feet of the anchored boats. And for the last two days, we have seen what Craig thinks is the surest sign of being in the tropics--flying fish. These are the small ones that fly like arrows for 30 or 40 feet when chased by predators. We couldn't find clear enough water for snorkeling but the boat was surrounded by trout-sized baitfish every morning. So after making inquiries about the camera and putting the word out, we left Tenacatita for the short 16 mile trip around the corner to the lagoon of Barra de Navidad. It turns out the channel into the lagoon is only partially buoyed, at the most about 12 feet deep, and follows a winding course into the anchorage area, which is 6-9 feet deep at low tide. We had downloaded many waypoints from S/V Kavenga (www.kavenga .com) and amazingly they were accurate at describing the edges of the channel and anchorage. Hence the song title referred to earlier. Above is a distant picture of the anchorage at Barra. As we took the photograph, we had the town and the ocean to our backs, and the channel leading to the anchorage to our right. You can see how it curves around with a shallow sand bar extending into it from the left. This picture was taken in the morning, before the afternoon wind came up. Had we but known that one should not arrive at Barra in the afternoon! The outer bay at Barra is surrounded by a beach full of modest tourist facilities, including many empty concrete condo attempts. Melanque, at the north end, is famous for having St. Patrick as its patron saint and two weeks of fiesta around St. Pat's day. Barra is at the south end between the bay and the lagoon. But what we had driven home immediately was that the bay and lagoon form a WIND TUNNEL. As we approached the narrow channel, the light westerly became a gusty 22-26 knot blow. We idled through the many anchored boats, making 4.5 knots downwind and having to really rev up the engine to come back upwind. We picked our spot and dropped our trusty spade anchor in about 9' of water (Sequoia draws 6.5'). After letting out 100' of chain, the anchor failed to set and it was obvious we were dragging. As we approached another boat, we motored back up to recover the anchor and try again. Up it came with gobs of greasy mud and fouled with an old fishnet. Now here is where our South Pacific experience stood us in good stead: we had been warned that boats drag all the time at Barra, and we could easily remember difficulties anchoring in Fiji in a similar bottom. In Fiji, we had tried at least four times to make our usually trusty spade anchor work, and dragged each time. But here we gave up on that anchor after the first abortive try. Craig dug into the bilge for our massive Fortress FX-85 (bigger and of a different design than our normal anchor) while Barbara motored around the anchorage avoiding the other boats. After getting the Fortress out--some assembly required--and dragging it up to the foredeck (it is almost 5' tall and weights nearly 50 lbs. ), Craig detached the chain from the normal anchor and fastened it to the beast. Our first attempt left us too close to another boat, but after a tip over the radio from a sympathetic soul, we put it down in a different spot and set it hard. As I write this, we have about 1.5' of water under the keel. They say that the only anchor that is too big is one you can't shift on the deck. It is great to have a big storm anchor, and experience has shown that mud may require a different type of hook, but it is a fire-drill to deploy it. Speaking of mud, the foredeck, spade anchor and the anchor buoy retrieved from the first abortive attempt were covered in mud and it took almost a half hour with the wash deck hose to clean it all up. But we are hooked-up, washed up, and Barbara just pulled a loaf of rich cracked-wheat bread from the oven. So we will enjoy another great evening in paradise...just as long as none of the southern California cruisers with their tiny little anchors drag down on us! Sequoia at anchor in the lagoon at Barra de Navidad.